Friends of the Royston Public Library | Going to Bat for Our Library! Welcome to the Royston Friends of the Library! The FOL is an advocacy and fundraising organization dedicated to promoting and providing support to the Royston Public Library. 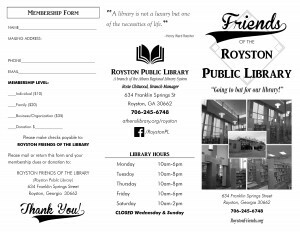 If you have questions about the Friends, or the Royston Public Library, please call the Library at 706-245-6748. Be sure to come visit the NEW Royston Public Library! Located next door to the old library, in the old Ty Cobb Memorial/City Hall/Civic Center. Check out the Royston Public Library on Facebook! Friends of the Royston Public Library · Going to Bat for Our Library!